Today I walked past a $2 Shop and cringed when I saw Christmas decorations in the window. Then I though, s*** it’s only 13 weeks to Christmas. Maybe you personally don’t care much about the festive season, but if you own a business, you should be thinking about strategies to leverage the overall shopping madness. People are in the ‘buying mode’, and they don’t shop just for presents…they shop, period. So if you position what you’re selling in front of your ideal clients, you’re highly likely to make more sales, then at any other time. The Guardian forecasts that Christmas online shopping will increase by 17% this year, so a well targeted Christmas marketing campaign will help you boost sales. encourage existing customers to buy more from you. Your Christmas marketing campaign will need to look different depending on what your answer is. For example, the fastest way to get new customers is through paid advertising (Google Ads, Facebook Ads, etc), while existing customers will be encouraged through email campaign. It’s important to know your goals, so that you can tailor your marketing campaign to your needs, then measure and track results. There is still plenty of time to educate your audience about your services and products. Rather then pushing hard for thesale, educate your target market about the benefits they are getting with your products and services. Create awareness, excitement and demand. So that when the time comes to present your offer, your audience will be in anticipation and have a desire to get your products or services. Get creative! We’re all bombarded with Christmas messages but if you think outside of the standard Christmas messaging, I’m sure you’ll come up with something unique around Christmas theme that appeals to your audience. Remember the “Elf Yourself” campaign from Office Max that went viral? The best ideas are always the ones that ask for participation of your audience. Ask them to share their images around Christmas theme or run a competition that ask for engagement. Such content always performs well as it get people to comment and share more then usual. If you plan out Christmas marketing campaign now, you have plenty of time to create quality content around your products and services. Think about how you can leverage the same content in different ways. For example, a review about your product can easily be broken into short posts for social media and turned into a short video about the product and how to use it. If you prepare and schedule your content in advance, then you only need to think about driving traffic to your website to make sales. That’s much easier then doing everything whilst also enjoying the joys of festive season. 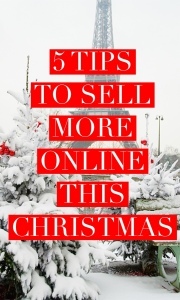 According to IBM, 45% of online sales during 2013 Christmas season were via mobile devices. If you’re website is not optimised for mobile, I don’t need to tell you that you may be missing out big time. Your website should be built so that it’s responsive, which means it’s design adjusts depending on the device and size of the screen it’s been viewed on. If it’s not and your website is build on WordPress you can add a plugin that turns your website into mobile ready website when it’s viewed on mobile, until you’re ready to get a new website with a responsive design. If you need help, just send us an email or give us a call on 0432 698 913 and we’ll help you set it up. Take a step further and start actively growing your fan base by identifying pages and groups, which have your target market. Then start regularly engaging with them by participating in discussion with good comments. This way your brand will be visible to much wider audience then just posting on your page. Only 20% of pins are original with a remaining 80% repins. So it’s highly likely that your original content will be repined over and over. Now, you make up your mind if this is worth your time. Need to learn how to leverage Pinterest – Click here & let me know how I can help.